Much of the information here is from this guide. Visit our December Holidays page for more resources. Making these videos is fun and informative, one of the most important pieces that you have to leave out of a short video are instructions about what to say! Looking for the blessings and more in-depth information? We have you covered! Christmas. Hanukkah. Which takes precedence? Can you do both? Can you not do both? The December holidays are one of the biggest conflicts many intermarried families face. Learn how to conquer them with a wide range of articles, resources, and links. Hanukkah is an 8-day long festive holiday that commemorates an improbable victory, some 22 centuries ago, by the Maccabees, a band of Jewish guerilla fighters seeking to reclaim their land, their Temple, and their sovereignty from the oppressive rule of the Syrian Greek Empire (also sometimes called the Seleucid Empire). The word “Hanukkah” means “dedication,” and it refers to the rededication of the Temple in Jerusalem which took place after the Maccabees’ victory in 164 BCE. Once the Maccabees had restored the Temple and re-purified it, the traditional story says that they sought to relight a lamp known as the “eternal flame.” But only one day’s worth of consecrated olive oil could be found, and it would be awhile before more could be produced. No one wanted to light the eternal flame only to see it sputter out after a day, but there was also a deep spiritual desire to rekindle the sacred lamp immediately. The priests decided to light it and hope for the best. Miraculously, it burned for eight days until fresh jars of olive oil were finally brought to keep the flame alive. 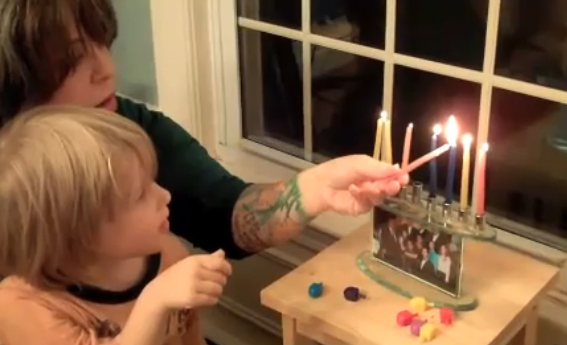 Hence, the eight nights of candle lighting for Hanukkah. Download our Hanukkah booklet HERE. Need help with the Hanukkah blessings? The blessings can be found in this section of our guide. Can someone tell me how to play the dreidel game? – We have this handy, printable instruction sheet that you can use. Do you have one of those instruction sheets for lighting the candles? – We sure do! What resources do you have to help with the so-called “December Dilemma”? – December doesn’t have to be a dilemma. There are many ways to have discussions about the holiday season. Here are some tips. And here is a great blog post from Laurel Snyder about why December isn’t such a dilemma. Wondering what to cook for Hanukkah? 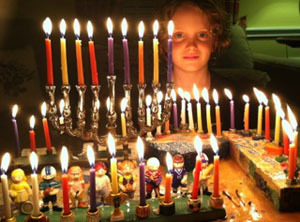 – Find out about the traditional foods of Hanukkah. Visit our food blog for both traditional and unique recipes. Searching for latke recipes specifically? We have a roundup of latkes and other recipes, like sufganiyot HERE. Curious about the S’mores latkes in the video? They are delicious. Do interfaith families have Christmas trees? – Some do and some don’t. But if you are looking for information about to tree or not to tree, we have that too. We also outline some specific approaches for interfaith families in our guide. Are there stories about people like my family? – We have stories from our staff for you to read, as well as parenting essays. We also have some thoughts on our Unscripted blog. Do you have children’s books to suggest? – of course! You can find those right here.